Its state-of-the-art rear-steer axle enables Supreme Turf & Soils’ new Mercedes-Benz Arocs tipper-grab to access areas which other six-wheelers with similar bodywork could not reach. When operators in the construction and related sectors acquire 26-tonne tippers, they invariably choose 6×4 off-road NG3 variants. The double-drive configuration of these trucks rules out a steered back axle. Rarely, though, do Supreme Turf & Soils’ trucks venture onto the ‘rough stuff’. 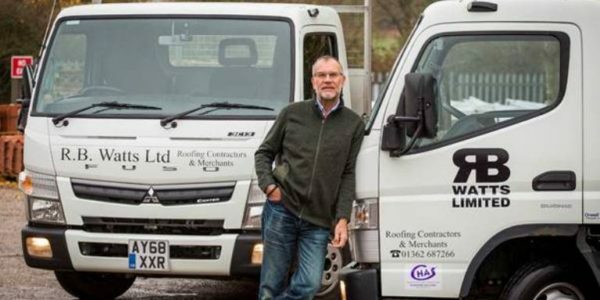 Instead, the company’s work for commercial, municipal and private clients mean its vehicles spend much of their time delivering to residential estates and other developments where the roads have already been made. 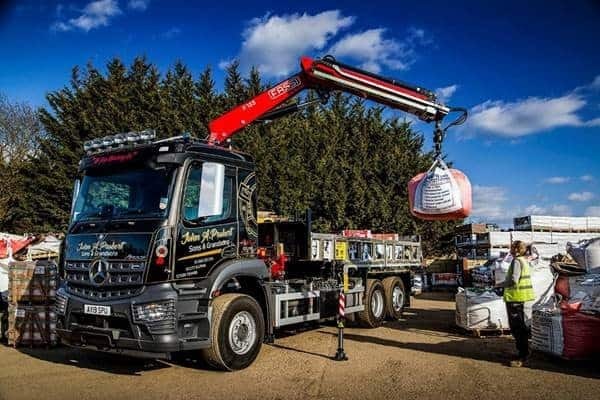 As a result, manoeuvrability in tight areas was the highest priority for the Billericay, Essex-based family firm when specifying its latest truck, rather than the ability to negotiate challenging terrain. Supreme Turf & Soils therefore opted to base its latest tipper-grab on a 6×2, on-road N3 chassis – the fact that only one axle is driven meant the firm could also specify the rear-steer axle which significantly enhances the truck’s agility by reducing its turning circle. 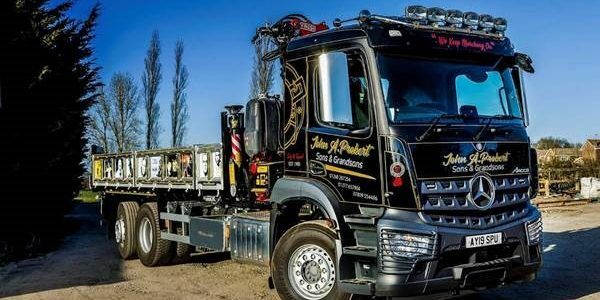 The Arocs 2532L bears the name of parent company John A. Probert Sons & Grandsons, and was supplied by Dealer Orwell Truck & Van. It has a ClassicSpace M-cab – the longer of the two day cabs available for the muscular Arocs range – and is powered by a 235 kW (320 hp) straight-six engine, which is paired with a Mercedes PowerShift 3 automated transmission. The rear-steer axle is liftable, enabling the driver to restrict tyre wear when running partially or completely unladen. It is also deloadable, a feature that allows weight to be transferred to the drive axle, thereby increasing traction should this be required on the few occasions that the Arocs does have to negotiate uneven ground. 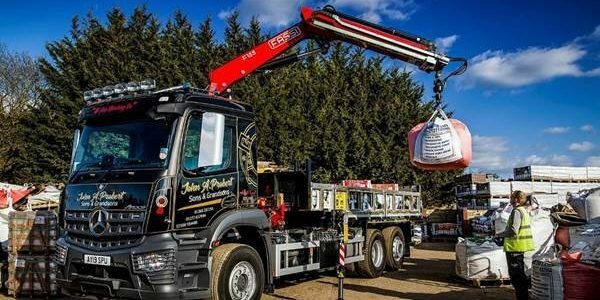 Installed immediately behind the cab is a radio remote-controlled Fassi 155 crane for which specially fabricated quick-release fittings allow operatives to switch easily between attachments, among them a clamshell bucket, and a brick and block grab. The double-skinned, heavy-duty aluminium tipping body, meanwhile, is by SB Components, of Wisbech. Like other vehicles on the operator’s fleet, it features a series of images celebrating the life of Lenny McLean, an East End boxer, bouncer, businessman, bodyguard and sometime actor, who appeared in the hit gangster film Lock, Stock & Two Smokin’ Barrels. 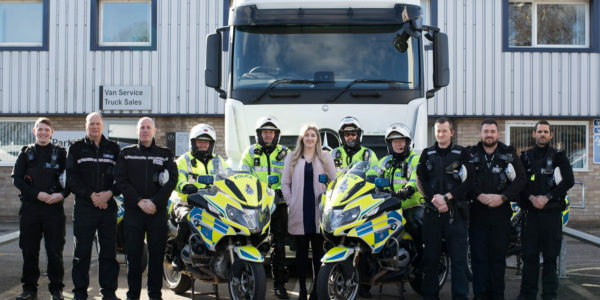 Complementing the truck’s eye-catching livery, which was applied by Grayers Graphics, of Grays, it is also fitted with Kelsa light bars, factory air horns and headlamp covers. John Probert established his landscaping products business in 1980. 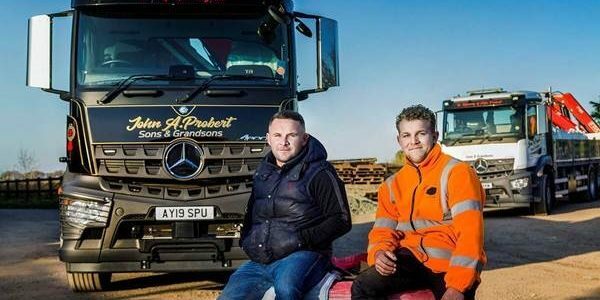 One of four separate companies within the Group, Supreme Turf & Soils has been trading since 2001, and operates within a 100-mile radius of base, but primarily across the Home Counties. 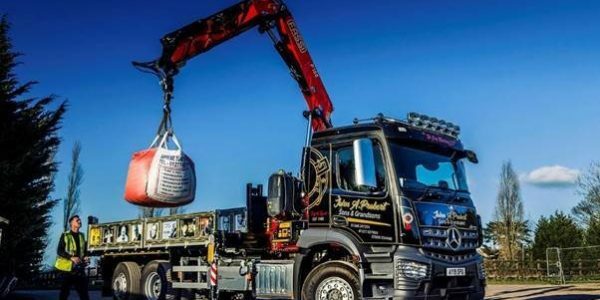 The new six-wheeler has joined a fleet which also includes two other Daimler trucks – a 6×2 Mercedes-Benz Arocs 2532L dropsider with rear-steer axle, and rear-mounted crane and brick grab, and a 3.5-tonne FUSO Canter tipper – both of which were delivered last year by Orwell Truck & Van. He continued: “The Arocs represents a substantial investment but we’re confident that it will prove to be money well spent. It certainly looks the business, and the driver loves it. The subject of a Mercedes-Benz Complete Service Contract, the Arocs is now being inspected and serviced at the Thurrock workshop of S & B Commercials, a sister company of Orwell Truck & Van. To find out more please visit the Orwell Truck and Van hire website. 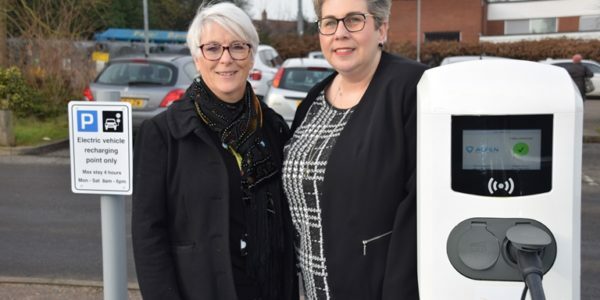 Keep up to date with all the latest Norfolk news and events here.